The National Enquirer included HairBoutique.com in the December 13th issue. 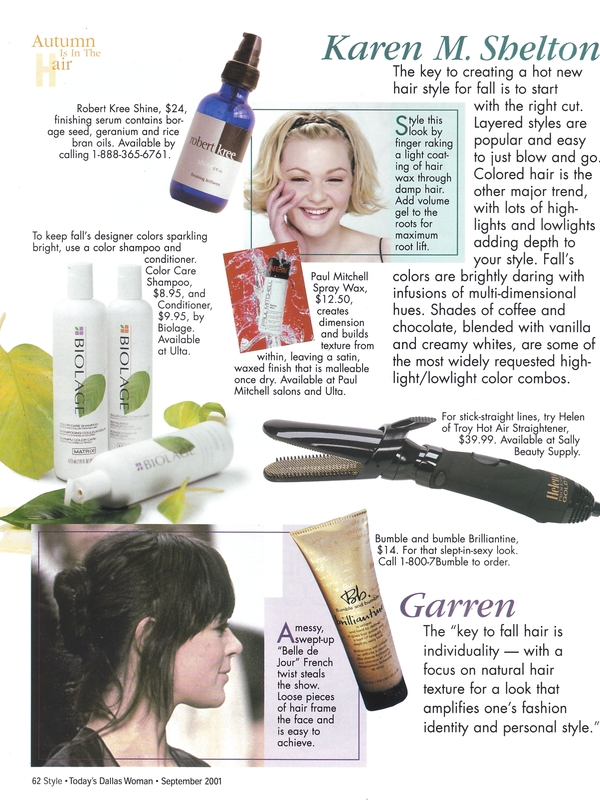 Karen Shelton was featured as the guest Hair Doctor for the November 2001 issue. Congratulations to our founder Karen Shelton who is quoted in the November 13th issue of Red Herring magazine in a special business article about the Telecom Corridor in Dallas, Texas. HairBoutique.com was listed by Nationwide News Pty Limited as one of the "Top 10 Beauty Sites" on the web according to www.hitwise.com.au. Included in the Top 10 besides HairBoutique.com was Nutrimetics, Avon, Nuskin, Bonnebell, Vogue, Niveaformen, The Body Shop, Clinique and Shiseido. Both HairBoutique.com and our sister company, T&S Software, were featured in the November Issue. Check out Karen Shelton's Fall Hair predictions in Autumn Is In The Hair in the September issue of Today's Dallas Woman currently available on newsstands. HairBoutique.com was mentioned in the September issue. The Technology Business Council has handed out its first set of techTITANS awards. Congratulations to our charismatic co-founder, Karen Shelton, for receiving the prestigious 2001 Tech Titans Award as CEO of an Emerging Corporation. We are honored to announce our new co-operative publishing relationship with the largest and hottest hair magazine in Russia, Hair!s How. HairBoutique.com's Spring 2001 photo shoot will appear in a future issue along with hair & beauty articles written by HairBoutique.com founder Karen Shelton. HairBoutique.com was featured in the Top 10,000 Women's Websites in WebBound Magazine. James Whittall's friends thought he was crazy when he said he wanted to sell men's cosmetics on the Internet. But since launching Menessentials.com last October, Whittall has found a niche market with an "exceptionally loyal" client base. Online base for Aylmer entrepreneur James Whittall. Site gives him the opportunity to expound on his "great loves"--writing, business, politics, and satire. A targeted approach to facial care that combines "some of the latest breakthroughs in anti-aging and rejuvenation therapies with an incredible tone enhancing and concealing system that supports a healthy masculine look. This site contains advice on choosing hair-care products for men. There's information on hair loss treatments for men and essentials on how to maximize a man's hair growth. Featured products include Nioxin, a hair-growth product and American Crew, a range of hair styling products for men. A series of articles on hairstyle information for guys, including the latest hairstyle trends. Gone are the days of taking magazines to the hairdresser now you can find your new 'do online. Ever wondered what your face would look like peeping out from under Jennifer Aniston's luscious locks? One click of the mouse will make it happen on the site that allows you to "pick up" your favourite star's hair and transplant it on to your head. Features a helpline where hairdressers Karen and Spencer promise to solve your woes. Karen Shelton, HairBoutique.com and our sister company, T&S Software, were featured as the company of the week in this issue. Thank you to Linda DuVal for including HairBoutique.com in her article. If you live in high altitudes, or if your hair is ever exposed to the elements, you will want to check out Linda's fabulous article on proper hair protection and care. We welcome HairBoutique.com's newest Marketplace Affiliate - World of Hair. Stop by and visit this great site. Congratulations to our own Karen Shelton for being 1 of 8 national winners. Karen won as "Best Employer" in the LA ceremonies for her innovative employment practices for T&S Software & HairBoutique.com. HairBoutique.com was featured in this article about noteworthy Internet Hair Sites. RICHARDSON - Karen Shelton, CEO and founder of T&S Software, was honored recently at the Working Woman's Entrpreneurial Excellence Awards for her excellence as an employer. T&S, a provider of intelligent voice products, offers perks for its employees such as haircuts, massages and regular company lunches. The company has retained all employees since it was established in 1995. Shelton is a finalist in the national Entrepreneurial Excellence Awards to be announced at Santa Monica, CA on April 2. "Our employees are T&S Software's most important asset," Shelton said. "I believe in pampering them because their satisfaction is reflected in our company's performance. Happy people are productive and deliver better quality products and services to customers." Shelton is also the founder and CEO of HairBoutique.com. The T&S website is www.ts-software.com. HairBoutique.com founder Karen Shelton was featured in an article in this issue. Cynthia Driskill has a simple management philosophy in running her software company, CDG & Associates. "I've always wanted to make my employees proud of their company and too happy to leave," Ms. Driskill said. That's turned into an award-winning attitude. Working Woman magazine has named Ms. Driskill as a regional winner in its third annual Entrepreneurial Excellence Awards. Ms. Driskill, whose company is moving its offices from Addison to Carrollton in May, is one of two area bosses to be recognized by the magazine. Carrollton resident Karen Shelton - whose firm, T&S Software Associates Inc., is based in Richardson - also is a regional winner. Both women will be featured in the magazine's May issue. Ms. Driskill is being honored because she has kept more than 90 percent of her employees and clients, said Erika Rasmusson, associate editor for the New York-based magazine. CDG & Associates' retention rate is "30 percent higher than industry norms," Ms. Rasmusson said. "To have both employees and clients be that loyal definitely stood out." Ms. Driskill said her success is because simple hard work. "You work your hardest, never expecting anything like this to happen," she said. "Then it does, and you feel great. But work goes on." Ms. Driskill founded the company in 1987, starting with only four employees. There are now about 100 people on the payroll. CDG & Associates, which helps clients integrate software products and computer systems, reported almost $21 million in revenues in 2000, up from $18.4 million the year before. Every employee owns a piece of the company. "When you see financial results on the balance sheets, that just makes you work that much harder," said Charles Martin, who supervises consultants at different client locations. "Cynthia's very gifted at empowering and encouraging anyone who's in her presence," he added. "She's found that people are more productive when you work on their strengths rather than focusing on something that's a weakness." Mr. Martin, who's been at CDG since 1989, said the company is generous with its perks. "We have a meditation room where you can relax, and juice and fruit is always provided," he said. "It's a work atmosphere conducive to productivity and a positive attitude." Ms. Driskill said employee morale is important because her company competes against national firms such as Accenture and Ernst & Young. "All you can do is deliver your best," she said. A San Francisco-based client appreciates Ms. Driskill's efforts. "I think where Cynthia and her organization stands out is in integrity," said Tony Morgado, human resources manager with the law firm Brobeck, Phleger & Harrison LLP. "Her organization takes ownership of a project as if it's theirs. They see through every project to the end." Mr. Morgado hired CDG to work with his previous employer about 10 years ago. When he moved to Brobeck, Phleger, he hired the company again to keep its human resources software free from defects. "We now have data that's extremely reliable," Mr. Morgado said. "I don't think that would be the case if we hired another company that just came in, did a quick fix and left." Get tips for living and grooming, rolled into one at the Hair-O-Scope. -- The Interactive Style Selector is disappointing for men (few suggestions) but it's packed with inspired and inspiring coifs for women. HairBoutique.com was mentioned in the recent article. When stress strikes at T&S Software Associates Inc., the employees know what to do - retreat to the back room and surrender to the hands of a masseuse. As a result, not a single employee has quit the 6-year-old Richardson firm. "I feel like my employees need to be pampered to do the best job they can, so I provide them a masseuse," said chief executive Karen Shelton, whose hands-on approach to stress relief has not gone unnoticed. Working Woman magazine recently named Ms. Shelton one of three winners for the Dallas region in its annual Entrepreneurial Excellence Awards. The others are Cynthia Driskill, president and chief executive of the Carrollton software firm CDG & Associates, and Ana Maria Lecea, president of Professional Performance Development Group Inc. in San Antonio. 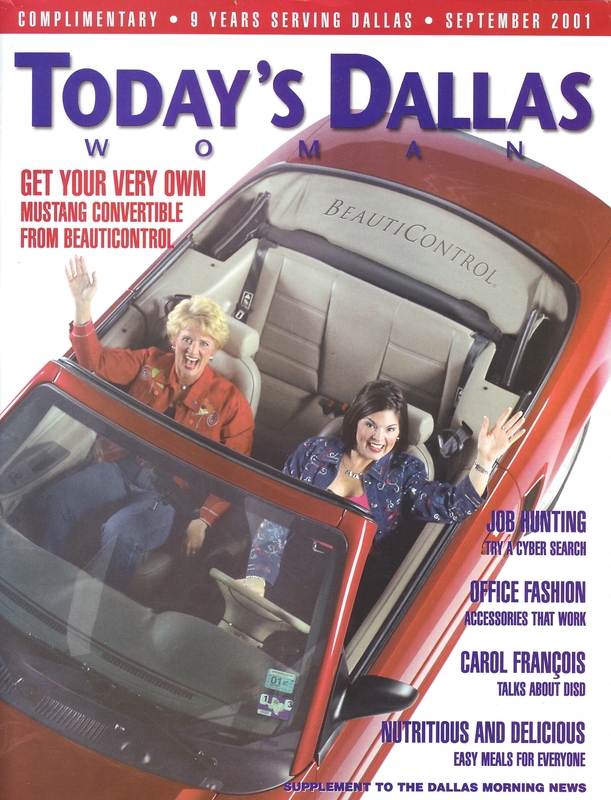 The magazine will select a national winner next month from among the three Texas women and winners in five other regions. All the finalists will be recognized in the May issue of Working Woman, and the winner will be the subject of a feature article. "Karen Shelton especially impressed us," said Erika Rasmusson, associate editor for the New York-based magazine. "The perks she offers, and the fact that her company's had zero attrition, really speaks well of her." Ms. Shelton doesn't like to take credit for the success of T&S Software, which now has 25 employees and reported $2 million in revenue last year, up from $380,000 in 1999. "We just keep growing, and all the credit's to my employees," Ms. Shelton said. "My office is my real home, and my businesses are my kids, so I care for them like they're family." Tony Sirchio, a T&S sales consultant, said Ms. Shelton inspires the staff. "Karen's really dynamic and hands-on. She fosters a real mentoring atmosphere," he said. "There are no games here. She really respects you and understands if you have problems." But she's no softy when it comes to business, said Ram Menghani, assistant general manager at NEC America Inc. in Irving, a T&S customer since 1999. "Karen is extremely aggressive and exceeds deadlines constantly," Mr. Menghani said. On one occasion, he said, Ms. Shelton's team delivered a product to NEC in six weeks even though they had a three-month deadline. Ms. Shelton said it was really a labor of love. "When I was growing up, I'd work at grocery stores. That was work," she said. "This doesn't feel like work because I enjoy it so much." Ms. Shelton founded T&S after her former employer, IEX Corp. in Richardson, was acquired by Tekelec. She funded the start-up by selling her IEX stock. "I didn't use any venture capital at all," Ms. Shelton said. The company's initials stand for Telephony & Speech, the firm's original name. It was shortened at the suggestion of an image consultant. "Some people just couldn't understand telephony," Ms. Shelton said. "They said it like tele-phony. It just confused too many people." So she tinkered with the name and also changed the company's thrust from consulting to product development. "Consulting's really a feast-or-famine industry, and we felt we could develop a great product. So we did," she said. The company's flagship product, the Zeus IP Media Server, providers telephone and Internet service providers with services such as call screening, wake-up and appointment reminder services as well as voice, fax and e-messaging. But what impressed Working Woman's editors were the perks she offers employees - a relaxed dress code, free lunches and visits from a masseuse and hair stylist. Ms. Shelton describes them as "minor" concessions to company productivity. But Ms. Rasmusson said, "I don't think we've ever seen an employer bring in a hair stylist to cut the employees' hair." That tradition started by accident. "I was too busy one day to keep my hair appointment, so I asked her [the hair stylist] to come here," Ms. Shelton said. Employees remarked on the unexpected visit, and their boss offered to provide them all haircuts. "Since then, we order pizza or Chinese and have made it a tradition," Ms. Shelton said. Haircut days allow employees to focus on work without worrying about rushing to the barber during the lunch hour, employees say. "It's a big time-saver," Mr. Sirchio said. "It's just one thing that we'd have to take care of." The masseuse shows up every Tuesday and sets up in the back room. "It's amazing how that renews the energy - for us all," Ms. Shelton said. Ms. Shelton said she needs all the energy she can get. She says she sleeps erratically, taking naps between 7 and 9 p.m. and 3 and 5 a.m. and working the rest of the time. Mr. Menghani of NEC said he laughs when he sees an e-mail that has come in during the middle of the night. "Yeah, I always know it's Karen when the message reads 2 a.m. or something," he said. But Ms. Shelton said she hopes her employees don't follow her example. "I work up to 20 hours a day, but I insist that my employees not work more than 40 or 45 hours a week." she said. "They need to be happy and rested." Each day, Ms. Shelton retrieves gourmet coffee and home-baked cookies for her staff. "They need the energy - just not when they're sleeping." The style gallery here offered links to more than a dozen stylists' galleries and their specialties, including ultra long hair, men's cuts and celebrity styles. It is one of the few sites that actually delivers children's styles, although the cuts were exclusively for girls. The interactive style selector lets viewers get a little more picky about what they're looking for and, unlike other similar tools, seemed to always bring back something to view regardless of how silly or specific our request was. Just one question: Is it just us or should everyone be alarmed when a model puts a floppy hat on her new hairdo? Thanks to Kay Barnes for coming to Dallas, TX and spending time with HB.com for her article about Karen Shelton in this month's issue. The HairBoutique.com thanks Ms. Claude Kaplan at Oxygen Network for her recent work with HairBoutique.com and our teen advisers, Ryan and Eric for the Oxygen Network. Thanks to India's Intelligent Beautician Magazine for their article about HairBoutique.com. HairBoutique.com is pleased to announce that through a brand new partnership with our friends at NaturallyCurly.com you can now buy the cool NaturallyCurly caps in our Marketplace. A profile of Karen Shelton was included in the article. In the profile Shelton listed her three favorite web sites as NaturallyCurly.com, RedHerring & Fast Company. Shelton was quoted in the article as saying: "I live, breathe and sleep business. I have since I was a kid." February 9, 2001, Friday, WORKING WOMAN Awards Local Women Business Owners in Texas Region With Third Annual Entrepreneurial Excellence Awards; Regional Winners Could Go National, DALLAS, Feb. 9, 2001. Article mentions Karen M. Shelton, CEO of HairBoutique.com and T&S Software as one of the regional winners. Teen.com featured HairBoutique.com & 5 Minute Updos on their prom site. Congratulations to our sister company - T&S Software for winning the impressive Editor's Choice Award for their Zeus Media Server product. HairBoutique.com was featured in today's issue of Today's News. Includes lots of links to other sites. Lots of information on this site. Includes discussion lists. HairBoutique.com - The Web's premier hair care site. This site has a lively hair discussion board, a gallery of beautiful women demonstrating various hair styles, hair care tips & articles, up to date news on hair care and hair styles, an online bookstore and book reviews and a weekly Q&A column "Ask Karen".